It's a brand new Ford Fiesta, arriving in Ireland a year after the model celebrates its 40th anniversary. This is the seventh generation of the car, replacing a highly successful version that, even in its final full year of production, still ranked sixth overall in the Irish new car sales charts. The biggest change is to be found inside, where the quite dated cabin is replaced by a swish new one of high quality and available with cutting-edge technology. But you can effectively think of this Fiesta as an all-new vehicle. Where do we start? The Fiesta hatchback competes in the B-segment, which is full of talented small cars and there are loads of new ones on the way too to make the Fiesta's life more difficult. Consider this little lot for a start: Citroen C3, Hyundai i20, Kia Rio, Mazda2, Nissan Micra, Opel Corsa, Peugeot 208, Renault Clio, SEAT Ibiza, Skoda Fabia, Toyota Yaris and the Volkswagen Polo. Every one of those has its merits and the Fiesta is tasked with bettering them all. Ford claims that the new Fiesta will be the most technologically advanced small car thanks to the many driver assistance systems that will be offered, including Forward Collision Warning, Front and Rear Parking Aid and Pre-Collision Assist with Pedestrian Detection, along with Adaptive Cruise Control, Blind Spot Information System, Lane Keeping Aid and Alerts, Cross Traffic Alert, Traffic Sign Recognition and Auto High Beam. There's more, such as Hill Launch Assist, Active Parking Assist with Perpendicular Parking and an Adjustable Speed Limiter. Vast, to say the least, and Ford has changed tack a little by presenting the new Fiesta in four distinct flavours initially, from the regular Titanium model and the sporty looking ST-Line to the luxurious Vignale. 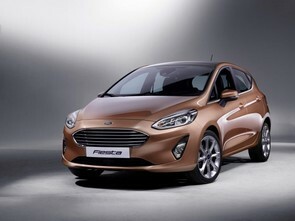 A bit of a surprise was the unveiling of the Fiesta Active, a crossover-like vehicle with more rugged design details. Petrol power will remain more important in this class and so Ford has confirmed the availability of five petrol engines, including a brand new 1.1-litre option. Diesel buyers have the option of a 1.5-litre engine in various states of tune. We already love the looks of the 2017 Fiesta, which is pretty and contemporary without losing the cheekiness of the outgoing car. Its interior looks to be a marked step forward too and we have no doubt that there will be demand for the Active model. The only thing that remains to be seen is whether Ford can price the new Fiesta competitively, as it has talked up a move upmarket.